On April 4th, Deputy Secretary-General Amina Mohammed launched the 2019 Financing for Sustainable Development Report, which state that achieving the financing needed to implement the SDGs is not just about finding additional investment, but also building supportive financial systems, and global and national policy environments. The UN Economic and Social Council's (ECOSOC) fourth Forum on Financing for Development Follow-up (FfD Forum) will take place from April 15-18. We will have updates for you on it next week. Faculty and students from the Graduate Nursing Program and the Honors Program at Molloy college joined us for two different occasions at the UN over this past month. Both groups went on tours and participated in briefings, and the topics included Global Health and Migration. Sr. Janet is attending the World Bank Conference in Washington D.C. this week. She will be reporting back for next month's newsletter, so stay tuned! Below is the link for the PGJ Weekly Update from March 27, 2019. For some reason, it was not showing up on our Blog Homepage. We apologize for the inconvenience. March is full of many different UN Events and Observance Days. Please utilize the information below about past and upcoming special days and events. The Commission on the Status of Women is still in full swing! Thank you to all of you who have joined us so far. We will have reflections and articles in the next newsletter. According to The Guardian, 1.4 Million people participated in the Youth Climate Strike world wide last Friday, March 15th. "We can no longer only focus on individual and separate issues like electrical cars, nuclear power, meat, aviation, bio fuels etc etc. We urgently need a holistic view to address the full sustainability crisis and the ongoing ecological disaster. And this is why I keep saying that we need to start treating the crisis as the crisis it is. Because only then - and only guided by the best available science (as is clearly stated throughout the Paris Agreement) can we together start creating the global way forward." ​#FightRacism, every time and everywhere it happens. As populism and nationalist movements are on the rise, all of us must stand up to promote respect, compassion and equality for all. Join our campaign on March 21, the International Day for the Elimination of Racial Discrimination. The UN Observance of International Women’s Day 2019 will take place on Friday, 8 March at UN Headquarters in New York. Featuring UN officials, activists and artistes, this event will highlight innovative solutions led by the UN system and its partners to help advance gender equality and transform women’s lives. PGJ Intern, Faith Yusko, participated in two mission visits over the last two weeks. She met with representatives from Kenya and Ireland as part of the Working Group on Girls Mission Advocacy Task Force. Sister Janet and Faith have been participating this year on a subcommittee of the NGO Mining group which works particularly on addressing unjust and unsustainable extractive practices and policies through the lens of the rights of local communities and indigenous peoples. We have been keeping abreast of the proceedings of the ‘Intergovernmental Working Group (IWG) on Transnational Corporations & Other Business Enterprises with Respect to Human Rights’ which meets in Geneva where all human rights work is based. After their fall meeting, organizations were allowed to make comments on the Zero draft of a legally binding treaty on transnational corporations. Sister Janet, working with the Sisters of Mercy and Religious of the Sacred Heart of Mary formulated the attached comments which were submitted to the IWG on February 28th. Other members of the NGO Mining Working Group also signed on to our formulated comments, as you will see by the signature page. In addition, this week, a Good Shepherd sister attending the Human Rights meetings in Geneva is giving a brief oral statement regarding the same. Some of these official meetings will be by "ticket only" and a limited # of tickets will be available each day; and in some cases they will have overflow rooms with live webcast to accommodate the high #s of participants expected. All official meetings however, will be Live streamed on UN WEB TV (webtv.un.org) for those watching from home. 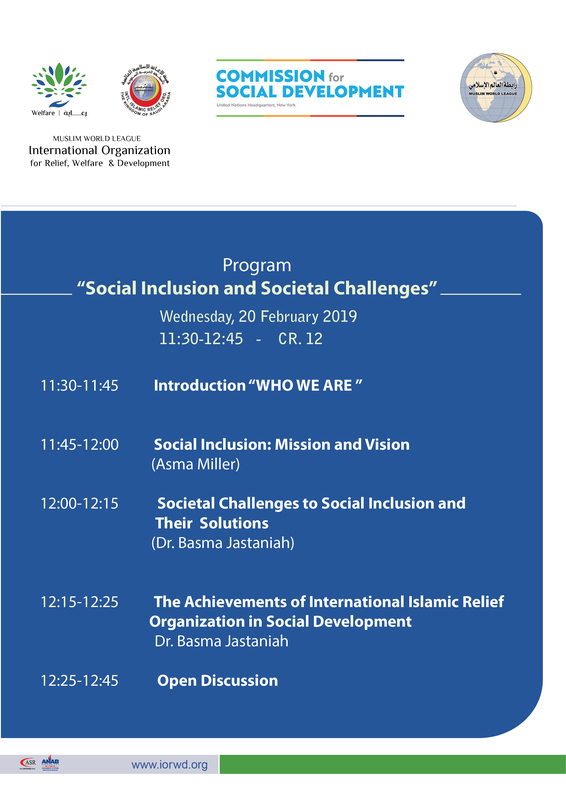 The program of 'side' events, or activities organized outside the formal program of the session of the Commission, provides an excellent opportunity for Member States, UN entities and NGOs to discuss themes of the Commission and other critical gender equality issues. 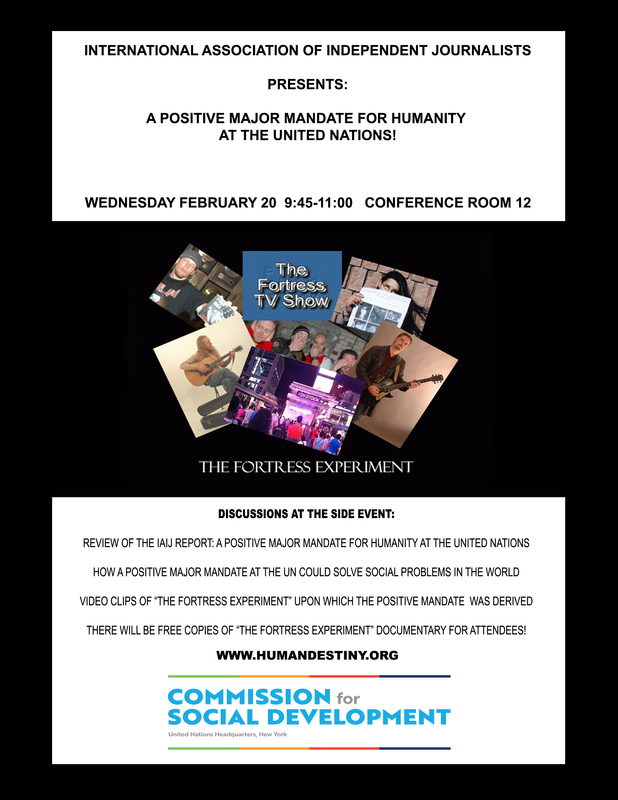 Side events that are held on the UN premises are those sponsored by Permanent Missions & UN entities - some of these will be available on UN WEB TV. Additional events, called 'parallel' events will be held off site at the Church Center and other locations nearby; these parallel events will not be live streamed. Please check back on the CSW 63 webpage as it gets closer to the Opening session, as there will be a link for an "App" that you can download on your portable devices that will give you all the CSW schedules, to include regular sessions, side events and parallel events. The App will also be available through your App store to download. Read the reflection from UN Environment and Resources Branch Chief, Steven Stone after the Flight ET302 Tragedy. PGJ will be represented at this Commission. Click the image above for more information. CSocD Youth Led Side Event was a Success! 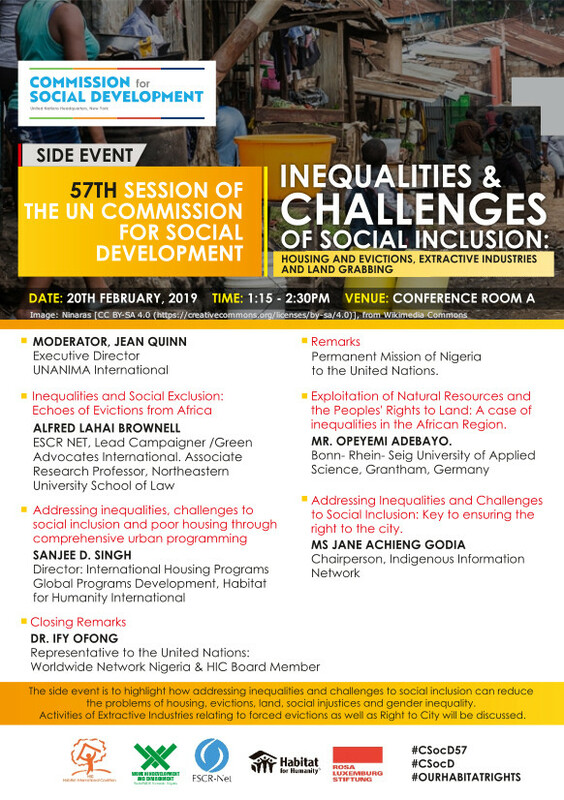 The fifty-seventh session of the Commission for Social Development (CSocD57) will take place from 11 to 21 February 2019, at the United Nations Headquarters in New York. The Commission is the advisory body responsible for the social development pillar of global development. Last Tuesday we attended the Fifth Annual Symposium on the Role of Religion and Faith-Based Organizations in International Affairs. This year's theme was “Financing for Sustainable Development: Towards an Economy of Life." The first panel, which focused on "Economy of Life: Faith-based Perspectives on Economic Justice as a Moral Imperative", featured Winifred Doherty of Congregation of Our Lady of Charity of the Good Shepherd. You can read and download her remarks below. ​Students from Molloy College participated in a day at the UN with the Partnership for Global Justice on Friday, January 11th. Professor McGann brought students from the Honors Program to engage in this learning experience at the United Nations Headquarters in New York City. Among this group of students were our two new Youth Representatives, Brianna Stephenson and Gabrielle Anzalone. The group had two briefing sessions lead by UN staff members during their visit. The first was a presentation by Dr. Donald Lee on the topic of Poverty and Hunger, and the second briefing was on Human Rights and was presented by Ms. Martina Donlon. Following the briefing sessions, everyone participated in a tour of the UN buildings. Students were able to observe paintings and sculptures around the UN that have been donated by member states, and well as learn more about the foundational pillars and the UN system in general. We had the opportunity to see the Security Council room, the Trusteeship Council room, the EcoSoc Chamber and the General Assembly Hall. The honors program students asked great questions throughout the day and were a pleasure for us to host. We are looking forward to additional educational partnership opportunities in the future. The Global Report on Trafficking in Persons as of 2018 was presented yesterday. If you did not get the chance to download it already, you can access it by clicking here. It covers 142 countries and provides an overview of patterns and flows of trafficking in persons at global, regional and national levels, based primarily on trafficking cases detected between 2014 and 2016. As UNODC has been systematically collecting data on trafficking in persons for more than a decade, trend information is presented for a broad range of indicators. This new branding comes with the focus of getting the news out, spotlighting issues, building partnerships, engaging the public, sharing knowledge, and working with the media. Stay tuned for photos and reflections from their visit on our social media outlets and in this month's newsletter. the creation of a “roadmap to prevent suffering and chaos”. ​Compact has the potential to change communities and lives. Chris Herlinger, of Global Sisters Report, writes about the 70th anniversary of the Declaration of Human Rights and the Sisters who advocate at the UN. PGJ is referenced here. Read the full article here. International Migrants Day is next Tuesday, December 18th. If you haven't already, please like our Facebook Page and feel free to share our posts about the United Nations Observation Days. "Evidence overwhelmingly shows that migrants generate economic, social and cultural benefits for societies everywhere. Yet hostility towards migrants is unfortunately growing around the world. Solidarity with migrants has never been more urgent." PGJ Presents Award to Fr. James Martin S.J. This past week, Sr. Janet Kinney and Sr. Susan McCarthy presented the 2018 Peace and Justice Award to James Martin, SJ. In addition to being a member of the Society of Jesus and Editor at Large of America Magazine, Fr. Martin has written 13 books, edited 4 others and written numerous articles and opinion pieces in the national and international press. He has been a commentator for mainstream media to include CNN, NPR, Fox News and TIME Magazine and was appointed by Pope Francis as a consultant to the Vatican’s Secretariat for Communications. With this award, we recognize his work as an avid learner, an author, a communicator, an advocate for the poor, and a witness to the Gospel Call to Love. Thank you for all of your efforts in pursuit of peace and justice Fr. Martin! "We are all imperfect people, struggling to do our best in the light of our individual vocations. We are all pilgrims on the way, loved sinners following the call we first heard at our baptisms, and that we continue to hear everyday of our lives." COP24 will take place from 2-14 December 2018, in Katowice, Poland. COP24 is the informal name for the 24th Conference of the Parties to the United Nations Framework Convention on Climate Change. Sir David Attenborough in a video inviting viewers to share their thoughts on climate change. The hashtag #TakeYourSeat will be used on social media to gather people’s experiences & opinions. December 10th is the 70th Anniversary of UDHR! The Universal Declaration – the most translated document in the world, available in more than 500 languages - is as relevant today as it was on the day that it was proclaimed. Please click the image above for more information. We are pleased to share with you this Advent & Epiphany Devotional Journey "Walking Towards Hope", which was developed by the Interfaith Immigration Coalition Partners. Please click the image below to open the document. As we prepare for Thanksgiving feasts with loved ones, we know too well there are countless others living fragile lives – especially the world’s children, many who are facing incredible hardships. We remember and pray in a special way for those individuals and families in the migrant caravan who are far from home, seeking a better life. We also remember and pray for those 40 million + persons who have experienced internal displacement in their own countries due to war and conflict, and who are among the world’s most neglected – often denied access to education, employment, and safe accommodations. ​‘Holding On’ is a digital campaign to raise awareness of their plight and to celebrate their courage and resilience. Their stories are both touching and heartbreaking. We bring them into our prayers. Next month COP24 will begin in Katowice, Poland. In preparation for these meetings on next steps in implementing the 2015 Paris Agreement, Climate Pilgrims are on the road walking from the Vatican to Katowice. These people of faith from around the world, are walking to show their commitment to climate justice. We give gratitude for their commitment and pray for their safety. ​Faith and I give special gratitude for your shared commitment to global justice – and send our wishes for a very blessed Thanksgiving! “In order to achieve peace and sustainable development… we must tackle the root causes of conflict and crises,” stated Deputy Secretary-General Amina J Mohammed. This year, the United Nations has selected the theme Building Sustainable and Resilient Cities; because cities need support to become resilient and develop their capacity to absorb the impact of hazards, protect and preserve human life and limit damage to and destruction of public and private assets while continuing to provide infrastructure and services after a crisis. ​PGJ Will be represented at the World Cities Day event today. **if you are attending this, please contact Sr. Janet! Read Sr. Janet's Travel Log here! Executive Director, Sr. Janet Kinney and Sr. Susan McCarthy, RDC - Board member of PGJ are on the Bus October 21st - 27th! You can find updates on the Partnership for Global Justice Facebook Page as well as on Twitter! UNGA President María Fernanda Espinosa Garcés urged the Second Committee to ensure its agreements are consistent with the 2030 Agenda, and aimed at accelerating SDG implementation. Espinosa noted that 21 SDG targets must be achieved by 2020, and over half of these relate to mitigating climate change, preserving ecosystems and making the consumption and use of natural resources more sustainable.